Berkery, Noyes & Co. represents Thomson in its divestiture of the assets of Sheshunoff Information Services to Alex Information and Highline Data LLC - Berkery, Noyes & Co., LLC. New York, May 17, 2004 — Joseph W. Berkery, President of Berkery, Noyes & Co, LLC, announced today that Berkery, Noyes represented The Thomson Corporation in its divestiture of the assets of Sheshunoff Information Services (SIS) to Alex Information (AI) and Highline Data LLC, an affiliate of Spire Capital. SIS is a division of The Thomson Corporation (NYSE: TOC; TSX: TOC). SIS is located in Austin, TX and Cambridge, MA. AI acquired the print publishing assets of SIS. For more than 30 years, Sheshunoff has been the number one name in "how-to" publications for financial services professionals. More recently, SIS has developed a complete offering of training courses and electronic work solutions for financial institutions. Through its A.S. Pratt & Sons brand, SIS offers a comprehensive line of products to assist attorneys in commercial and banking practices, financial institution in-house counsel, mortgage banking professionals, and corporate treasurers with compliance, research, management, and guidance tools. 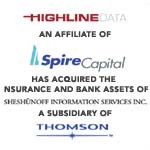 Highline Data acquired the insurance and bank data assets of SIS. Sheshunoff Insurance Solutions is the brand name for an array of insurance products. In banking, the assets include BankSource and BankSearch, product lines which deliver data principally from federal regulatory authorities, and provide proprietary financial, M&A and branch data on U.S. banks and financial institutions. Berkery, Noyes specializes in investment banking for the information, publishing and communications industries. Among the most recent transactions completed by Berkery, Noyes are the sale of Weaver Publications to Prospect Partners, LP, the divestiture of the McGraw Hill Companies’ Juvenile Retail Publishing Business to School Specialty, the acquisition by Taylor & Francis Group plc of Marcel Dekker, Inc., the sale of Cliggott Publishing and the Oncology Group to United Business Media and the sale of Forum Corporation to the IIR. The Thomson Corporation (www.thomson.com), with 2003 revenues from continuing operations of $7.6 billion, is a global leader in providing integrated information solutions to business and professional customers with operational headquarters in Stamford, Conn.